Study by health, transport and safety experts shows key problems in road safety, exposure to air pollution and physical inactivity. Photo via EMBARQ.org. 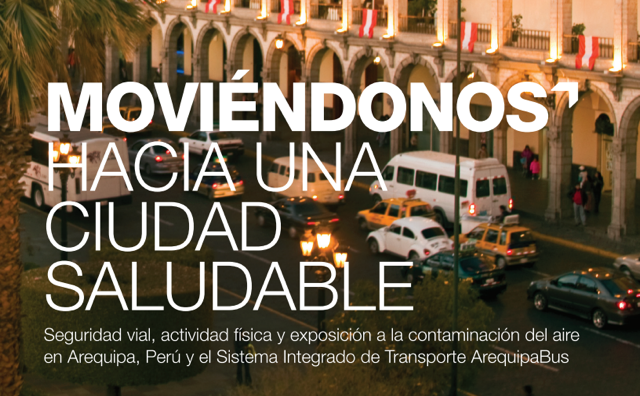 The report, Moviéndonos hacia una Ciudad Saludable (“Moving Us Towards a Healthy City,”) provides an overall assessment of public health in Arequipa. The study was prepared by EMBARQ’s Director of Health and Road Safety Claudia Adriazola and Assistant Project Manager Ben Welle, in partnership with the Pan American Health Organization (PAHO). From 2007 to 2009, in all of Arequipa there were 2,288 crashes involving 5,128 people, 320 deaths and 1,081 serious injuries. Of those killed, 59 percent were pedestrians. Along the future trunk BRT corridor, there were 350 crashes and 321 fatalities or injuries. Only 9.9 percent of residents citywide were found to regularly walk for transport; only 3 percent walked enough for leisure to gain health benefits; and only 3 percent of residents biked enough to improve their health. Air pollution levels for PM 2.5, a harmful mix of fine particulate matter in vehicle emissions, were found to have a 24-hour mean of 0.195mg/m3 along a route of five key future bus stations and within the buses themselves. This is well above the World Health Organization (WHO) guideline of 0.025mg/m3. The report is part of an ongoing project that will measure these same factors after the SIT-AQP project is implemented. In the last three years, the Provincial Municipality of Arequipa has been transforming the city’s transport network through the SIT-AQP, which aims to create an integrated transit system with 11 modern and efficient private operators, construct a new high-quality BRT corridor, renew public transit fleets, and build new bicycle and walking infrastructure. While the report does not provide policy prescriptions, it is a snapshot into the local public health issues related to urban transport, and it shows how the SIT-AQP is an opportunity to confront these health issues through improving road design for pedestrians, providing higher quality mass transport, reducing the number of polluting vehicles and providing safer and more attractive ways for residents to walk and bike. Established in November 2008, EMBARQ Andino is a nongovernmental organization dedicated to promoting transport projects and sustainable mobility with a special focus on public health. Its main project has been implemented in the city of Arequipa, aimed at developing an integrated mass transit system, promoting new bicycle paths and pedestrian streets, and increasing accessibility to transport in low-income areas. EMBARQ Andino is part of a global network, based in Mexico, Brazil, India, Turkey and the Andean Region, that catalyzes environmentally and financially sustainable transport solutions to improve quality of life in cities.